As shown in the urban planning classic, The Ideal Communist City, soviet planners also believed they were smart enough to know how every single plot of land in their cities should be used. The cities built on their planning principles were appallingly ugly and unlivable. They were environmentally sustainable only so long as communism kept people too poor to afford cars and larger homes. If de Blasio believes in this planning system so much, why doesn’t he implement it in New York City? The biggest obstacle, he says, is “the way our legal system is structured to favor private property.” He blames housing affordability problems on greedy developers who only build for millionaires. The reality is that, under the control of private property owners, New York City housing was quite affordable in 1969. It was only when planners began to interfere with private property rights that housing prices spiraled out of control. In 1969, New York City median family incomes were $,9692 and median home prices were $25,700, for a value-to-income ratio of 2.7. This was affordable because, at 5 percent interest, someone could devote 25 percent of their income to a mortgage that is 2.7 times their income and pay off the loan in 15 years. Housing was even more affordable in the suburbs, as value-to-income ratios in the New York metropolitan area were 2.6. By comparison, value-to-income ratios in 2015 were 8.8 for the city and 5.1 for the metropolitan area. Even at today’s 3 percent interest rates, someone buying a home that is 8.8 times their income could devote a third of their income to the mortgage and not be able to pay it off in 40 years. What happened since 1969 to make housing so much less affordable? 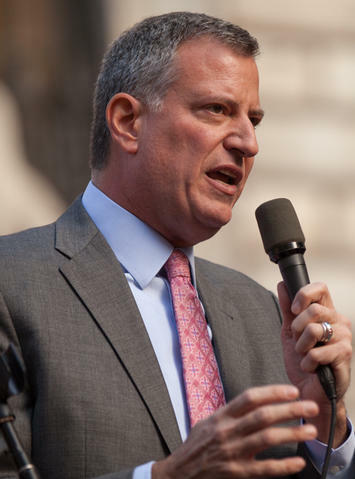 Contrary to de Blasio, one thing that didn’t happen is that developers got greedier. While there is no accurate measure, I am sure that people were just as greedy in 1969 as they are today. The human desire to accumulate wealth hasn’t changed in thousands of years, which is one reason why the kind of socialism that de Blasio favors never works. Instead, one thing that happened was rent control. New York state first imposed rent control in 1950, but the law exempted rental housing built after 1947, and other housing was gradually deregulated through 1969. But in 1969, New York passed a new law that applied rent control to all housing, thus discouraging anyone from building new rental housing. Another thing that happened was the city’s historic preservation ordinance, which was passed in 1965 and which has gradually restricted more and more of the city from redevelopment. More recently, New York City responded to unaffordable housing by passing an inclusionary zoning ordinance which provides affordable housing for a tiny number of people at the expense of making it less affordable for everyone else. New Jersey and Connecticut did their part by passing statewide growth management laws, thus restricting people’s ability to escape New York City’s high housing prices by moving to the suburbs. Connecticut first passed its law in 1974 and New Jersey in 1986. All of these actions are examples of the kind of government control that de Blasio supports, and all of them contributed to the high housing costs that de Blasio objects to. The next time he wants to find a greedy person to blame for unaffordable housing, he should look in a mirror. Submitted by Low Budget Dave on Tue, 10/10/2017 - 13:03. In addition to zoning rules, affordable housing set-asides, rent control, and the other usual suspects (such as minimum parking requirements), most any economist will tell you that the other thing driving real estate prices up in New York is supply and demand. There is only so much land, and people on the high end of the income spectrum tend to bid up land prices past the point where people living on low wages can afford it. Inflation hits real estate differently than it hits income. If you made twice the minimum wage in 1969, (or $3.20 an hour) then you could rent a small place in NY, or a large place in almost any other city. If you make $14.50 an hour now, New York is hardly the only market where you are priced out. At the old "30% of gross income", that works out to $750 a month, which won't even get you an apartment in Chattanooga, much less Seattle or Los Angeles. Finally, you are implying that de Blasio wants to follow the Communist model and simply confiscate the land that he feels isn't zoned properly. This is a argument called "reduction to the absurd." All he seems to be saying is that he wants more rent controls. I think you might have a better argument (that rent controls aren't working) if you didn't scream "Communism" at every tenant protection law. The alternative is a city like Houston, which has hardly ever had planning, zoning, or really any regulation of land use at all. Right up until five years ago, Houston was being held up as a shining example of what free-market capitalism could achieve without government interference. Houston has long been known for office buildings that spring up in the middle of suburbs, but they were also known for letting developers build housing developments on the banks of the reservoir. Indeed, private property rights in Houston trump everything, and residents repeated voted not to require runoff drainage, or, for that matter, any building code at all. Now Houston has experienced three 500-year floods in three years, and the bill is coming due. Development has removed the ability of the ground to absorb water, so even the slightest rain overpowers the city's storm water system. Even if you ignore the deaths from Hurricane Harvey, the cost to rebuild the city will be at least $100 billion. You may think that is a small price to pay for the freedom to build whatever you want where ever you want it, but I disagree. I think it is a warning of the ultimate downside of letting unfettered property rights take priority over citizen safety.